Assalam o Alaikam to all, I hope all of them are good. This is a short news about Batch Three Candidates which also applied for Prime Minister Scheme in October month, and they waiting as selected candidates or not. Candidates Selection based on merit, Higher Qualification candidates have a good chance for selection. So please check your Email Account on daily basis, Because a selected candidates receive an email from Info@nip.gov.pk. Now I want to tell you how NIP select a candidate for the scheme. After receiving your qualification information through a web portal, NIP send your document to HEC for verification of your Degree or Diploma. In case your Degree or Diploma qualification wrong or fake you will not be able for selection. NIP also check your Pakistani Nationality, and your CNIC Number send to NADRA for verification of your CNIC Number. If your CNIC Number is wrong and did not match with your qualification record you will be consider as rejected candidate. After receiving selected candidate email from NIP please click on below link for your next Account process. is there is any list of selected candidate? list is under process. if you in selected candidates list you will received an email from nip. MUJHE B SIR MAIL RECEIVE NHE HUI. PAR LIST MEIN NAAM THA.. It's end of last week of December list is not uploaded yet. bhai jan abi tk kisi ko mail ai bhi hai ya nahi koi slect hua bhi hai kay nahi. janab meny D.A.E kia hua hai or oct me e apply kia tha mery doston nay bhi kia tha abi tk kisi ko bhi koi bhi mail nhi ai. No still you and also we have to wait. mugy abi mail recieve nae hoi??? jald he ho jaye gi apki qualficaion kya hia. Sir my name is sana but i havnt received any e-mail from so now what can i do? i am eligible by criteria. sir,I applied for nip in oct 2016. I completed my BE civil engg in sept 2016.
when will be uploaded list of selected candidates? What if tracking id is lost? this is the helpline number but they do not shares the information requested just say you to have wait further. us din m ny apka add pra tha k apply krny ki last date 11 feb 2017 hai but link hi opn nahi hota to apply kasy kia jaye??? March 20,2017 mai next batch start ho ga mujhy mery dost ne btaya ha jo ye scheme avail kr chuka ha aur un ka batch 15 march ko he end ho ga okkkk so all of us relx and also check email in routine way..
please recover by alternative email or your cell number. Sir ni ye baat kahy hy k Nip ka jo process hy o degree hec si check karwaty hy aur NIC ka bi zikar kya k ye bi Nadra office su check karaty hy aur Merit ka bi zikar ki hy......? Noshki, Balochistan k kab hongy???? Koi list abhi upload hni a ??? Hm logo ko koi mail ni ayee , jo list net pr shw hore uske elwa koi hne a ??? list konse site pe diya hae?pls mention it. Hope you would be fine. Please make me updated about the status of my internship status either I have been selected or not.I have yet not received the email and have been unable to access any list. sir bilal akber .. this is my tracking no. 86768..... and cnic is 5120195196545... still I have no email or sms by pmyts... plzzz help us..
Dear i applied for pmyts on 6 jan of this my application hav been received to nip office they forwarded to me email tht your ur application successfully received bt they forwarded to me my tracking id 0.so now i hv some confused how should i confirm myself. ..
mein ne bhi Diploma base py apply kiya tha kiya unki selection abhi baqi hy????? Respected Sir. i haven't received email. and i forgot my tracking id as well. kindly help me to find out my name in the list. dear mn tracking id bhool gya ab? Hello sir where to check the list? Me also not received any email of selection ..
please wait after verification of your qualification if you eligible for this scheme you will receive an email from NIP. or yai phase 3 ki selction kab ho ge???? please call to NIP office for changing password. please call to NIP office for Password changing. 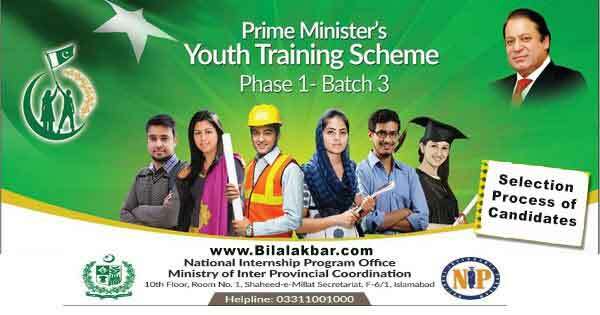 Salam mene prime minister intrnship program k liye apply kia tha but ab me apni email id bhul gai hun..ab me kase maloom karu?? asalam alikum friends. my ID is 23787 , there is no data about my status that i am selected or not plz any one check my status and inform me thanx. Also I recieved Confirmation email from HEC with a Ticket ID.